Rev 8:10.11. Then the third angel sounded: And a great star fell from heaven, burning like a torch, and it fell on a third of the rivers and on the springs of water. The name of the star is Wormwood. A third of the waters became wormwood, and many men died from the water, because it was made bitter. The only star which fell from heaven was the one Jesus Christ mentioned in reference to Satan. Luk 10:18. I saw Satan fall like lightening from heaven. The text does not state the word star. But Satan was one of the stars of heaven before he fell or was cast out of heaven. What does “burning” mean in prophecy? Jerm 51:24.25. 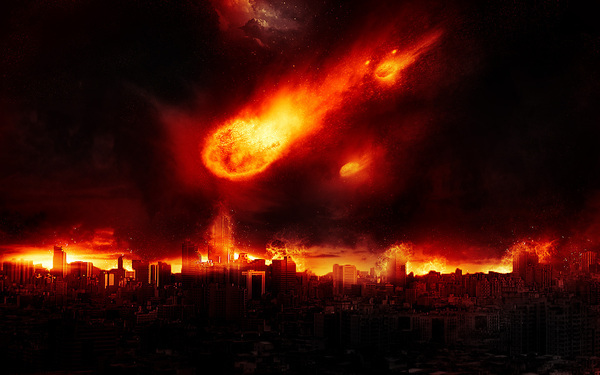 “And I will repay Babylon and all the inhabitants of Chaldea for all the evil they have done in Zion in your sight,” says the Lord. “Behold, I am against you, O destroying mountain, who destroys all the earth,” says the Lord. “And I will stretch out My hand against you, roll you down from the rocks, and make you a burnt mountain. But you shall be desolate forever. (A burnt mountain means Babylon will be desolate and be destroyed forever). Dan 7:11. I watched then because of the sound of the pompous words which the horn was speaking; I watched till the beast was slain, and its body destroyed and given to the burning flame. 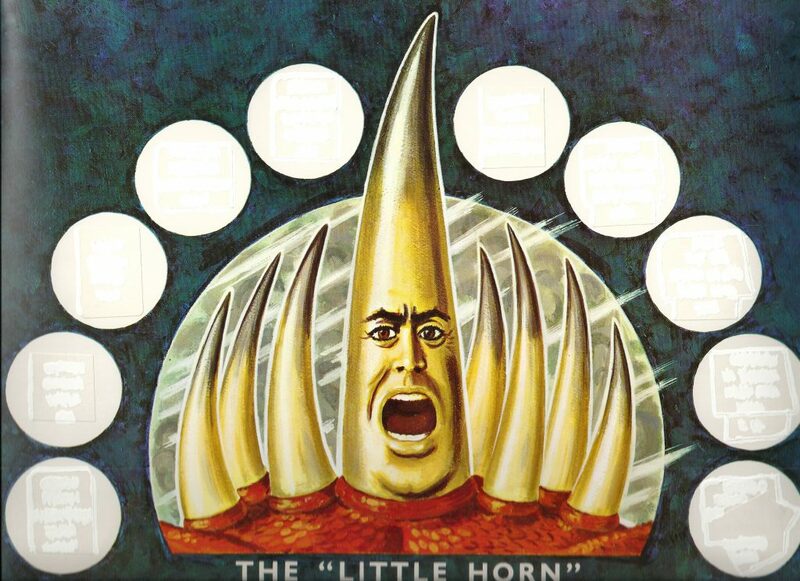 (The little horn is symbolized by the papacy in the Roman Catholic Church system, which will be given to the burning flame and be destroyed forever). Is 33:12. (Judgment on Zion). And the people shall be like the burnings of lime; like thorns cut up they shall be heard in the fire. Rev 18:8. (Refers to spiritual Babylon). Therefore, her plagues will come in one day – death and mourning and famine. And she will be utterly burned with fire, for strong is the Lord God who judges her. A great star falling from heaven, burning like a torch, refers to Satan who was an angel. He was cast out of heaven and fell to the earth. The burning refers to his final destruction in the future. What does Wormwood mean in tis text? A bitter and poisonous plant, probably one of the large composite genus Artemisia, several varieties of which occur in Palestine. They are woody plants with a strong aromatic odor and bitter taste. (Prov 5:4). The undiluted juice is noxious (Rev 8:10.11). Bible writers follow the Oriental custom of symbolizing calamity, sorrow and disappointment with plants of this nature. (Jerm 9:15, Lam 3:19). This is another description of Satan who is compared to a bitter and poisonous plant. What is the symbolic interpretation of “rivers and springs of water” in this text? Rev 7:17. For the Lamb who is in the midst of the throne will shepherd them and lead them to living fountains of waters. (Living fountains of water up in heaven refer to the water of life from the river of life in Rev 22:1). Rev 8:10. Then the third angel sounded: And a great star fell from heaven, burning like a torch, and it fell on a third of the rivers and on the springs of water. (This star who represents Satan has polluted the teachings leading to eternal life). Rev 16:4. Then the third angel poured out his bowl on the rivers and springs of water and they became blood. (Why this plague? Because in Rev 16:5.6. For they have shed the blood of saints and prophets, and you have given them blood to drink. For it is their just due. This could be literal blood on the springs of water and rivers). Rev 22:1. And he showed me a pure river of water of life, clear as crystal, proceeding from the throne of God and of the lamb. (The drinking of this water from this river leads to eternal life). John 4:10.11. Jesus answered and said to her, (The Samaritan woman) “If you knew the gift of God, and who it is who says to you, `Give Me a drink,`you would have asked Him, and He would have given you living water. Where then do you get the living water? John 4:13.14. Jesus answered and said to her, “Whoever drinks of this water will thirst again, but whoever drinks of the water that I shall give him will never thirst. But the water that I shall give him will become in him a fountain of water springing up into everlasting life. (Waters of teachings from Christ leading to belief in Christ and eternal life). John 4:15. The woman said to Him, `Sir, give me this water, that I may not thirst, nor come here to draw. John 4:22.23. Salvation is of the Jews. But the hour is coming and now is, when the true worshipers will worship the father in spirit and truth; for the father is seeking such to worship Him. (Water of life is related to worshiping the Father in spirit and truth). John 7:38. He who believes in Me, as the scripture has said, out of his heart will flow rivers of living water. (This water is related to believing in Christ and preaching the gospel of Christ). Rivers and springs of water are related to the following: This star who represents Satan has polluted the teachings of the Bible leading to eternal life, as a result the waters are polluted and lead to death. Living fountain of waters leading to eternal life. Fountain of life from Christ leading to eternal life. It involves worship in spirit and truth to the Father. It involves believing in Christ and preaching the gospel of eternal life. There are different interpretations of the word rivers in prophecy, and the context determines what interpretation we shall use. Rev 16:12. This river is a border between God´s people and their enemies. When this river Euphrates dries up, it means that the border has disappeared and the enemy go in for the attack. Rev 12:15.16. Rev 12:15. So the serpent spewed water out of his mouth like a flood after the woman, that he might cause her to be carried away by the flood. (War and persecution from the papacy against the Protestants during the Protestant Reformation). The serpent spewed out of his mouth a river of persecution, war and torture during the Middle Ages against God´s people. Rev 22:1. This river of the water of life involves worshiping God, believing in Christ in the spirit and truth. Interpretation of the text Rev 8:10.11. And a great star fell from heaven, burning like a torch refers to Satan who will be destroyed in the future. The great star fell on a third of the rivers and on the springs of water refer to Bible teachings leading to eternal life. When this star Satan fell on a third of the rivers and springs of water, they became bitter because the wormwood had poisoned these waters referring to teachings from the Bible about eternal life and worshiping God in the spirit and truth. Hence, the teachings from the Bible by the established church became corrupt and false. This resulted in many men dying a spiritual death, from these false teachings entering the church of God. 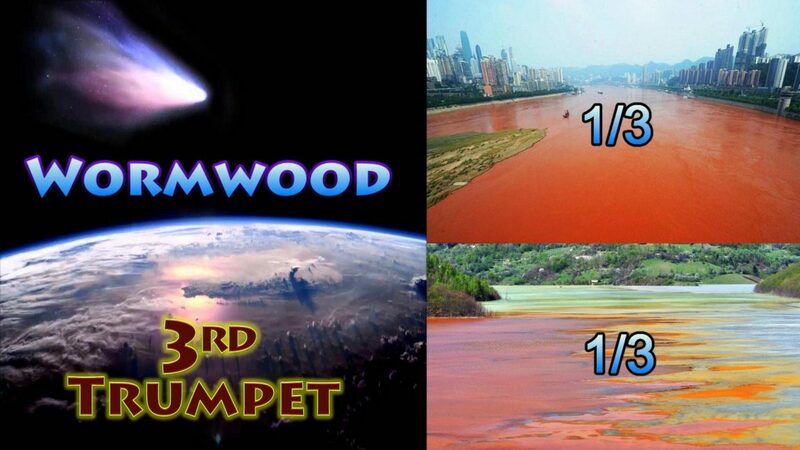 After the second trumpet in Rev 8:8.9. After paganism and worldliness entered the Church, God sent another warning to the Church by the blowing of the third trumpet. What danger came into the Church after Paganism had entered the Church? The bishop of Rome became the head of the Church and this was the beginning of the papacy taking control of the Church and all the people who worshiped therein. Satan who fell from heaven as a burning star, was the mastermind behind this project. When the bishop of Rome took control of the Church, then many of the teachings of the Bible where polluted and destroyed. They were substituted by the additional teachings of the papacy, so as to control the people of the Church under their hierarchy. The Bible was taken away from the people in the Church and was substituted by the Latin Bible of which only the clergy could preach from and interpret from. As a result, the clergy began a form of brain washing the people to believe in what they taught and interpreted from the Bible, so the members could come under their control. This form of brain washing has been carried out in the Church for many centuries right up to this present day and has deluded many millions of Roman Catholic Church members. As a result of the Churches false teachings, many millions have died spiritually. “To secure worldly gains and honours, the Church was led to seek the favour and support of the great men of the earth; and having rejected Christ, she was induced to yield to the representatives of Satan-the bishop of Rome. “At every assault, Christ presented the shield of eternal truth, saying, ´It is written.´ To every suggestion of the adversary, He opposed the wisdom and power of the world. In order for Satan to maintain his sway over men, and establish the authority of the papal usurper, he must keep them in ignorance of the scriptures. The Bible will exalt God and place finite men in their true position; therefore, its sacred truths must be concealed and suppressed. When did this 1,260-year prophecy begin? Texts from the book of Daniel referring to the little horn power as the papacy. Dan 7:8.20. I was considering the horns. And there was another horn, a little one, coming up among them, before whom three of the first horns were plucked out by the roots. And there, in this horn, were eyes like the eyes of a man, and a mouth speaking pompous words. Dan 7:24. The ten horns are ten kings who shall arise from this kingdom. And another shall rise after them; he shall be different from the first ones and shall subdue three kings. (Visigoths, Vandals, Ostrogoths). Dan 8:8. Therefore, the male goat grew very great; but when he became strong, the large horn was broken, and in the place of it four notable ones came up toward the four winds of heaven. Dan 8:9. And out of one of them came a little horn which grew exceedingly great toward the south, toward the east, and toward the Glorious Land. Dan 8:10. And it grew up to the host of heaven; and it cast down some of the host and some of the stars to the ground and trampled on them. Dan 8:11. He even exalted himself as high as the Prince of the host; and by him the daily sacrifices were taken away, and the place of His sanctuary was cast down. Dan 8:12b. and he cast truth down to the ground. He did all this and prospered. Dan 8:13b. How long will the vision be, concerning the daily sacrifices and the transgression of desolation, the giving of both the sanctuary and the host to be trampled underfoot? Dan 8:14. 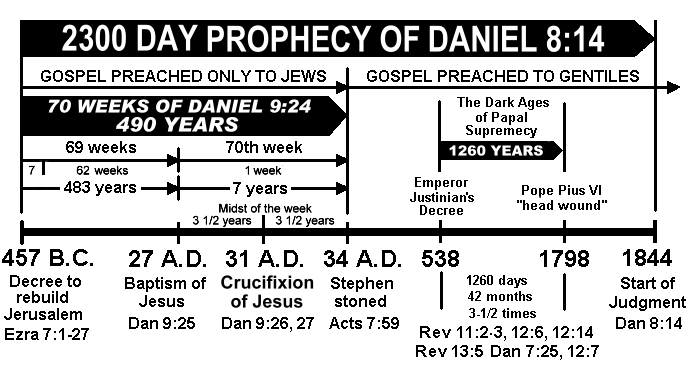 And he said to me, “For two thousand three hundred days (prophetic years),” then the sanctuary shall be cleansed. The following is a list of the false teachings from the papacy incorporated into the Roman Catholic beliefs of the Church, which are opposite to the truths found in the Bible, and therefore have poisoned the clear water of teachings from the Bible. The infallibility of the pope. One who is incapable of erring and one who is unfailing. Under the teachings of the apostolic succession, the pope has absolute authority and is the supreme ruler of the church. (The apostolic succession cannot be proven. The papacy says they have a list of credentials handed down from the apostle Peter right down to the first pope, however these credentials are false. The supreme ruler of the church according to the Bible is Christ and Christ only. Ephes 5:23.24). The Eucharist or communion is the time when the bread turns into the body of Christ and the wine turns into the literal blood of Christ by some miraculous event. (This has never been proven. When Christ gave the ordinance of the Communion to his disciples in Math 26:26-28, he is referring to the bread and wine as symbols of his body and blood. When Jesus said, “take eat this is my body,” the disciples did not literary eat his body, but they ate bread which was a symbol of his body). The sale of indulgences. (Lyon 269). Indulgences guaranteed the crusader´s entry into heaven and reduced or abolished his time in purgatory. (Lyon 333). Under Pope Sixtus there was a need for greater amounts of money in the form of gifts and this led to the peddling of indulgences. (There is no text in the Bible referring to indulgences. It is a teaching thought up by the papacy to enlarge the coffers of the Church). Purgatory is a place of spiritual purging of sins when one has died and on the road to heaven. (There is no scriptural reference for this teaching). Salvation by works and belief in Christ. (One is only saved by faith in Jesus Christ and not by works. Ephes 2:8.9). Forgiveness of sin can only be done by the pope, bishops and priests. (This is not scriptural. Only God can forgive sins. Luk 5:21. If we confess our sins, He is faithful and just to forgive us our sins and to cleanse us from all unrighteousness. 1 John 1:9). The papacy say that Gods word from the Bible is no rule of faith. (The Bible says 2 Tim 3:16 All scripture is given by inspiration of God, and is profitable for doctrine, for reproof, for correction, for instruction in righteousness). The papacy has changed the 10 commandments of God in their own Bible compared to the original Hebrew. They do not specify what the Lord´s day is, like the Sabbath which is the seventh day of the week. The papacy has changed the Sabbath day from Saturday the seventh day of the week to Sunday the first day of the week. We observe Sunday instead of Saturday because the Catholic Church transferred the solemnity from Saturday to Sunday. The papacy believe in the veneration of the saints. (The Bible says in the ten commandments Ex 20: 4 “You shall not make for yourself a carved image – any likeness of anything that is in heaven above, or that is in the earth beneath or that is in the water under the earth; you shall not bow down to them.” This includes the worshipping of saints and their images). The papacy believe in the immaculation of Mary the mother of Jesus Christ. (Immaculation means that the virgin Mary was conceived free from the taint of original sin in 1854 declared an article of faith of R.C. Church. However, the Bible says in Rom 3:23 “all have sinned and fall short of the glory of God.” This includes the mother of Mary). The question is, how do these false teachings take away the truths of the heavenly sanctuary? So, the only priest we have to come to for the forgiveness of sins (1 John 1:9), is in the heavenly sanctuary and not any institution on earth. This is Christ only. The pope is not the supreme authority and High priest over all the church and churches in Christendom. Christ is our only High Priest and has supreme authority in the heavenly sanctuary and over all men on earth. Heb 4:14 “Seeing then that we have a great High Priest who has passed through the heavens, Jesus Christ the Son of God, let us hold fast to our confession.” Heb 8:1.2. Heb 9:11. Ephes 5:23.24. Furthermore, salvation in the heavenly sanctuary is not by works but by faith alone on the merits of Christ the Lamb of God and Christ as our High Priest. John 1:29. Ephes 2:8. Siegfried H. Horn, Seventh-Day Adventist Bible Dictionary, (Washington D. C.: Review & Herald Pub. Assoc., 1979), 1184. Ellen G. White, Early Writings (Washington D. C.: Review & Herald Pub. Assoc., 1945), 211. Ellen G. White, Confrontation (Grantham, Lincolnshire: The Stanborough Press, 1978), 50. George La Piana and John Swomley, Catholic Power VS. American Freedom (New York: Prometheus Books, 2002, 211. Don F. Neufield and Julia Neuffer, Ed., Seventh-day Adventist Bible Students´Source Book, Vol. 9 (Washington D.C.: Review & Herald Pub., 1962), 886.